ECO-WOLF, INC.'s AL-TOOLTM is a thixotropic dry mixed compound designed to be mixed with a ISO or Vinyl Ester resin. It is designed to give optimum resistance to heat, fatigue and distortion of vacuum form tooling surfaces and it minimizes print-through. Mix one bag of AL-TOOLTM with approximately 6.6 lbs of high heat ISO resin. Mix well. 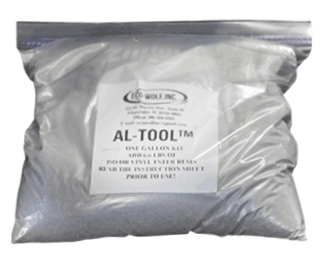 AL-TOOLTM dry mix is supplied in bags designed to yield 1 gal of AL-TOOLTM to cover 18 sq ft of surface area. AL-TOOLTM can be brushed or sprayed. Due to the thixotropic nature of this material, pre-mix catalyzation is recommended. Deep cavities may require a combination of spray and brush application. The oldest molds made with AL-TOOLTM & T-LAMTM are still in continuous operation SINCE 1979! Molds made with this combination will withstand 450°F heat exposure with no blisters, cracks or print through and greatly increases a mold's lifespan. Combined, these two superior tooling components produce long-life molds QUICKLY, EFFICIENTLY, AND WITH LOWER FABRICATION COSTS THAN CONVENTIONAL MOLD PRODUCTION TECHNIQUES.